What is extracorporeal shock wave therapy (ESWT)? Shock waves are high amplitude, short wavelength single waves that are generated by specialized devices. The high energy waves are generated in a liquid and transmitted into tissue through a pad or probe. As there is no interface with the air the shock waves are hardly audible. Shock waves have been used to break up kidney stones for over thirty years and the procedure is referred to as “extracorporeal shock wave lithotripsy” (ESWL). When shock waves were first used to break up kidney stones the probe was pushed up the urethra or through an incision into the body cavity. 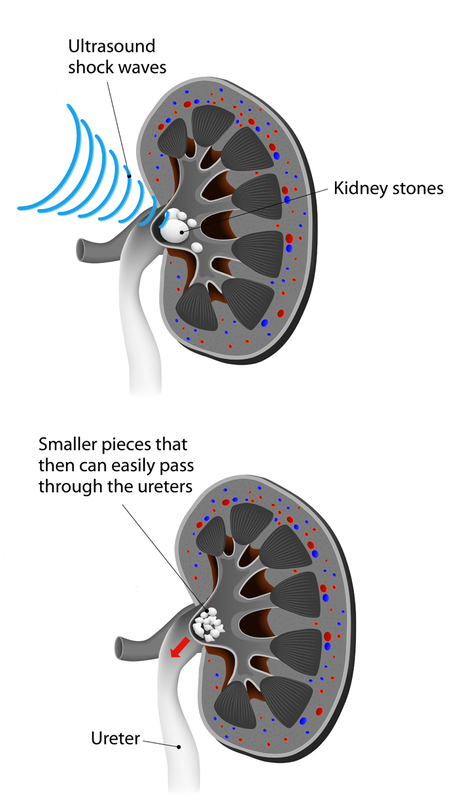 Subsequently it was discovered that shock waves could be focused from outside the body and still retain the concentrated energy to break up kidney stones. This non-surgical treatment was a lot safer and so it was termed “extracorporeal” to distinguish it from “intracorporeal” technologies. The energies required to treat erectile dysfunction are about one tenth those required for lithotripsy. The waves are therefore “low intensity” and the word “shock” is inappropriate. The word “extracorporeal” is hardly relevant these days which is why we refer to “low intensity focussed extracorporeal shock wave therapy” as “SONICWAVE™”. ESWL has been used over 100 million times and so the medical community has plenty of data on the side effects of the technology, adverse reactions and what can happen when it is administered incorrectly. It is because of the amount of studies that researchers are confident that low intensity extracorporeal shock wave therapy and SONICWAVE™ are free of adverse side effects. Studies on the potential uses of shock wave for treating myocardial disease by promoting angiogenesis (growth of blood vessels) began in the early 2000s. Low intensity extracorporeal shock wave therapy has been used in physiotherapy for nearly two decades now and its effects and contraindications are well known. The technology began being researched for treating erectile dysfunction in Europe and Israel from 2007 onwards. After many cases of individuals experiencing positive results and a number of randomized, double-blind and sham-controlled confidence grew in the therapy as an effective, evidence-based treatment. Earlier this decade the therapy became accepted in Europe and Israel and is becoming the therapy of choice without the side-effects of drugs and the challenges of surgery. Shock waves can be focused, which enables their effects to be applied subcutaneously on specific tissues such as the corpora cavernosa. They are substantively different from radial pressure waves, that are sometimes confusingly referred to as “radial shock waves”. See a comparison between focused shock waves and radial pressure waves here. Recent studies have demonstrated that the extracorporeal application of low-intensity shockwaves to the myocardium may induce the release of angiogenesis-mediating growth factors such as endothelial nitric oxide synthase (eNOS) and vascular endothelial growth factor (VEGF), as well as induce the recruitment of endothelial progenitor cells.